On the train from Forte Dei Marmi to Florence, I gaze out the window capturing images of the rapidly changing scenery; luscious green as far as the eye can see to wildly colorful graffiti, and trash accumulated at the station platforms along the way. Conversations play in the background of my thoughts, most of which I cannot understand as my Italian is limited to simple common words, at least for now. I sit alone and silently consider my father’s journey of sixty years ago. 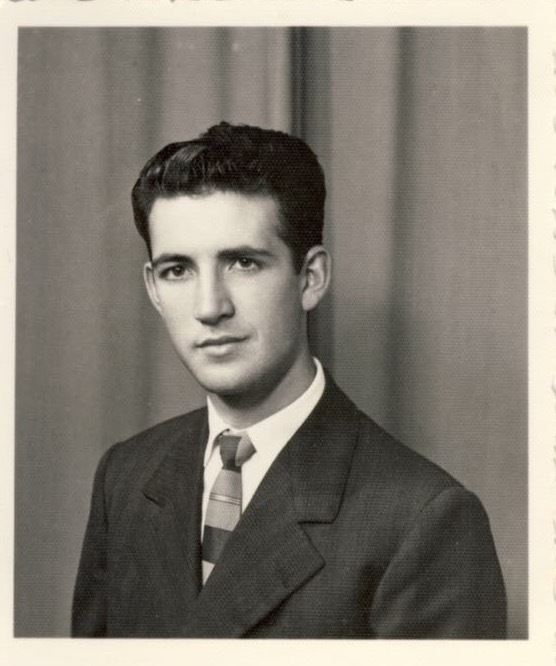 A young man, my dad left his home in Italy to study his final year of high school in the United States, landing in Milwaukee, Wisconsin, the home of his host family, The Hansens. I met them once. Besides these few facts, I know little of his first year in the States. So for me, the story of my father’s life in America began when he met my mother playing volleyball on Lake Michigan’s Bradford Beach in the summer of 1958. I suppose I chose this day to begin my version of his story because it was the beginning of our family. Without my dad ever specifically telling me so, I assumed his exchange student status to be a means to a greater end. I would wager that he intended from the start to stay in the States, become a citizen and live the American dream. I imagined it took a certain kind of person, a person of foresight and great courage to leave his home and country for the possibility of something more. I understood my dad to be that kind of person and I admired his bravery and strength of character. More recently, I yearn to hear my dad’s narrative of his story. Something I never asked him. I want to know his motivation for coming to the States, the triumphs and hardships of his first few years. Having left all that I know and love in the US, I consider other possibilities for my father’s journey and look for parallels in our lives. With a new perspective I wonder now if he had planned to stay or did his love for my mom change the course of his life. Of course with his passing nine years ago, this is an impossible conversation, a wish never to be granted. Instead, I look for answers and signs from the Universe in the daily experiences of my own journey. Prior to moving to Italy, I would not have described myself as adventure seeking. A high achieving rule follower with a desire to please was more my gig. Until it wasn’t. When my hard work went unacknowledged or my love unreturned, my mind, heart, and body grew restless. I broke every rule in the name of love, making irreparable mistakes at the expense of others. And that became my pattern, a series of blunders and lapses in judgment followed by quick fixes and escapes, no long term plan to get my life back on track. I ignored the impact of my actions on my self-worth and the well being of those I professed to love, mainly my children. I was exploring back then, but for all the wrong reasons. I chased love and happiness. I am grateful to have taken the journey inward long before I decided to move to Italy. Turned out all exploring, risk-taking, and bravery had to begin within me. I found the courage to be vulnerable, to tell the truth about myself, my life, my relationships, and identify my fears. I learned that I need not look for love. I am love and it will always find me. I can love without conditions, and forgive myself and hope that those I hurt will one day forgive me, too. I am different today, embarking on a deliberate and thoughtful journey, one that has left me with no loose ends, no trail of broken hearts or pain left in my wake. Instead, I face my fears, make my own way, and explore the endless possibilities of this life of mine, a life full of love and without regret. As the train rumbles along the tracks, tears blur my vision and slowly spill down my cheeks. In my mind, my dad and I are comparing notes about our journeys. And just as he did when we were kids, he reminds me of my good fortune, to have been blessed with so many opportunities. He is happy that I am exploring Italy, to learn about him, my family, and myself. He knows I am ready, here for the right reasons. It occurs to me that my dad and I are more alike than I ever imagined. I may never know the details or true story of his journey, but I do know that his life was full and beautiful. In the end, I suppose that’s all that really matters. Eyes closed, I take a deep breath and look again to my memories. I am sitting with my mom at our kitchen table. I am excited, proud to be telling her about a recent achievement. I hear her voice clearly, pride with just a hint of worry. Pride because she believes I can do anything, and worry because she knows I am always restless. Oh, Christine, you are your father’s daughter, she says. I smile because she no longer has to worry. I am proud, brave, and happy. Christine has recently moved to Italy, taking a sabbatical from her years in education, most recently as an Elementary School Principal. She is spending her days exploring her heart and mind, beautiful Italy and her ancestry, and the possibility of writing as her 3rd career.